Bracelets that turn into mini-umbrellas, shoulder-pads that transform into air-pollutant filters and a bracelet-mounted gadget that resembles a hockey putt and aids in navigation are just a few of the futuristic conceps presented at the South by Southwest Interactive Conference (SXSW) in Austin,Texas, earlier this year. The theme for all the exhibits was Wearable Tech and the exploration of the connection between fashion, art culture and technology. Although years away from actual fruition, Frog Design Inc who dreamed up these ideas is optimistic they will eventually become a part of our everyday reality. Frog Design began in Germany's Black Forest back in 1969, the brain child of entrepreneur, Hartmut Esslinger, who pioneered a new era of "emotional design," which was focused on improving via innovative technology, the everyday lives of the modern consumer. The young firm worked for many brands, including Sony and Luis Vuitton, both of which they helped to generate more than 100 products including the first standalone television set, the black-box Trinitron, and the Walkman. Over the years, their client base expanded to include: Disney, Logitech, Sun Microsystems, NEC, Packard Bell, Lufthansa and Olympus. In the 1980s they designed language for Apple in a successful venture that was recognized as the "design of the year" by Time Magazine. 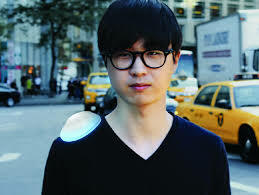 Adam Puden, senior interaction designer at Frog, introduced at the SXSW conference a special session entitled: Wearable Drones: High Flying Fashion in which he presented detailed concepts for 16 wearable drones that could become commonplace by 2030. This innovative product series envisions a future in which fashion and personal devices are bound together in a new interface. Pruden believes wearable drones can go far beyond the tasks of a simple smart phone and become the personal computers of tomorrow. In his own words: "Smartphones have led to huge advances in things like gyroscopes, accelerometers and batteries. This same technology is being paired with quadcopters, essentially creating flying smart phones." Wearable tech is no longer confined just to the body thanks to autonomous flying technologies, which have the capacity to extend the limitations of the human body. Consider Breathe, an oval-shaped drone made from a flexible plastic lung, whose small propeller sits on a shoulder and monitors pollution levels. Scout is a sphere-shaped wearable drone with a rubber case that facilitates exercise and play and doubles as a health monitor. 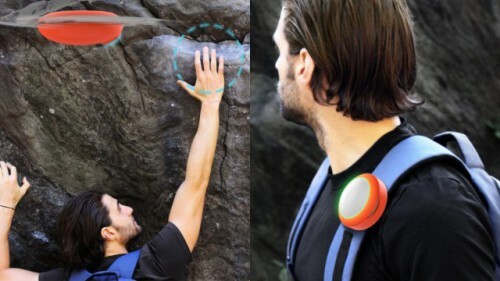 Once air-borne, its propellers transform into a rock -climbing game by mapping out a route via an interface surface onto the face of the cliff. Wearable drones are the invisible enhancements of every day urban interactions that will blend into the clothing and accessories of tomorrow. Wearable tech's newest fashion interface will include: clothing, jewelry, watches, arm-bands, leg-bands,hats and helmets. One question lingers: Are we ready for a wearable drone invasion? LEGO Ice Brick Tray – Cool!